For other uses, see San Francisco (disambiguation). Satellite image of part of the San Francisco volcanic field, presented as a 3D terrain model. Note that North is to the right. The San Francisco volcanic field is an area of volcanoes in northern Arizona, north of Flagstaff, USA. The field covers 1,800 square miles (4,700 km²) of the southern boundary of the Colorado Plateau. The field contains 600 volcanoes ranging in age from nearly 6 million years old to less than 1,000 years (Miocene to Holocene), of which Sunset Crater is the youngest. The highest peak in the field is Humphreys Peak, at Flagstaff's northern perimeter: the peak is Arizona's highest at 12,633 feet (3,851 m) and is a part of the San Francisco Peaks, an extinct stratovolcano complex. The volcanic field seems to have formed from a geological hotspot. As the North American plate moves over the spot, new volcanoes appear. Thus, the newest volcanoes are at the east side of the field. Most of the volcanoes are basalt cinder cones, but there are also large lava domes consisting of rhyolite and dacite. Given that Sunset Crater is such a young volcanic feature of this area and that eruptions have occurred every several thousands of years in frequency, it is likely that there will be a future eruption in the San Francisco Volcanic field. However, it is impossible to predict when and exactly where a new eruption might occur. The United States Geological Survey does say that a future eruption would likely be in the eastern side of the volcanic field, where the most recent volcanic activity has occurred. Such an eruption is likely to be small and pose little hazard due to the remoteness of the area. Popular tourist and hiking destinations in the volcanic field include the Kendrick Mountain Wilderness, 20 miles northwest of Flagstaff; and Sunset Crater, which is particularly popular because it is easily accessible and has interesting horizontal lava flows at the base of the crater. Areas of the volcanic field have been used by NASA for testing techniques for exploration in a simulated extraterrestrial terrain environment. NASA has also conducted the Desert Research and Technology Studies (DRATS) tests here. 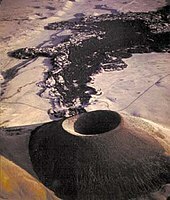 SP Crater is a cinder cone with a basalt lava flow that extends for 4 miles (6 km). Black Point lava flow in the San Francisco volcanic field. Little Colorado River at lower right. Astronaut photo from the International Space Station, 2009. ^ Holm, R. F., and Moore, R. B., Holocene scoria cone and lava flows at Sunset Crater, northern Arizona, Geological Society of America Centennial Field Guide, 1987. pp. 393-7. ^ Allison, Lee (June 14, 2009). "Robot recon underway in Black Point lava field". Arizona Geology. Retrieved April 16, 2017. ^ a b c d e f Wood, Charles A.; Jűrgen Kienle (1993). Volcanoes of North America. Cambridge University Press. pp. 278–281. ISBN 0-521-43811-X. ^ "Crater 160, Arizona". Volcano World. Archived from the original on September 26, 2008. Retrieved May 7, 2007. ^ "Double Crater". Geographic Names Information System. United States Geological Survey. ^ "SP Mountain, Arizona". Volcano World. Retrieved May 7, 2007. ^ "Sunset Crater". Global Volcanism Program. Smithsonian Institution. Retrieved May 7, 2007. This page was last edited on 4 December 2018, at 04:08 (UTC).